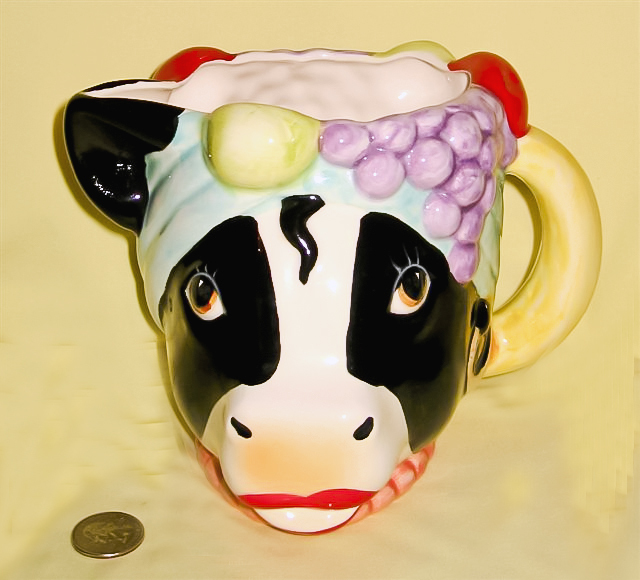 This part of the collection includes some fully legitimate cow creamers (by the criterion of two holes) which pour through the mouth. There are also a few pitchers. The nicest of the head creamers are the porcelain ones made by Royal Bayreuth – these come in a variety of colors; the photo of four creamers was also shown in the Favorite Brands theme, but it is repeated here as a lead-in both to others by Royal Bayreuth, and to some ‘look-alike’ copies. These four – actually two cows and two water buffalo – bear the Royal Bayreuth, Bavaria stamp. 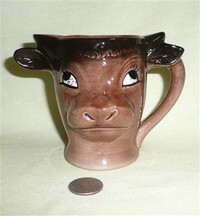 The other two cows are impressed Deponiert (as are some of the ones with the Royal Bayreuth stamp) but without the crest. 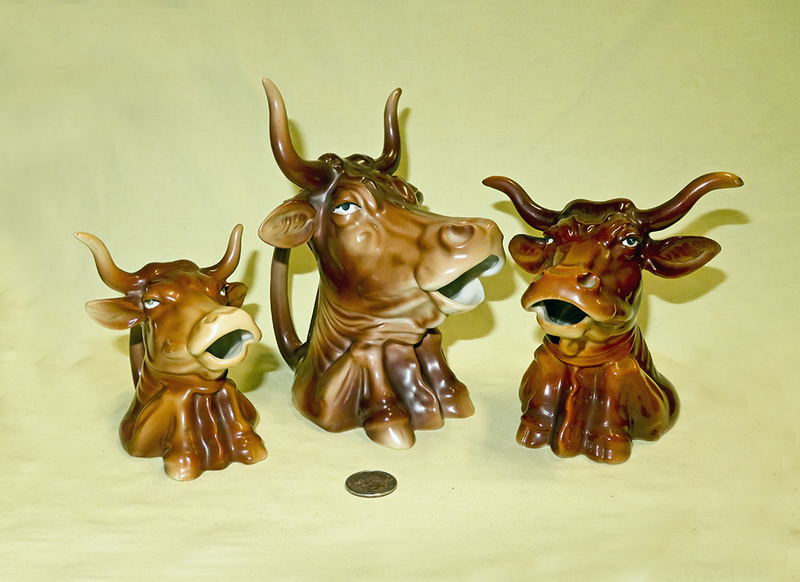 Here are three more nice examples of Royal Bayreuth cow or bull head creamers. To reiterate a bit of what’s in the Favorite Brands section, Royal Bayreuth has been produced in the same factory in Tettau, Bavaria, since 1794. They have used a number of different marks, usually including the Bavarian coat of arms, two lions rampant and a shield. The crest, name Royal Bayreuth and Bavaria were used from 1870-1919, and some later ones may say Germany or even U.S.Zone from 1945-49. Many made for export also bear an impressed 'Deponiert' which in English translates to deposited. Next, here are some that were either made by Royal Bayreuth for oither companies, or at least bear a close resemblance. These two heads are marked for the Mitchell Woodbury Company of Pearl Street, Boaston. I haven't bee able to find a date for their founding, but is was obviously quite some time before the 1899 date shown here on their billhead (source www.historicnewengland.org). They were retailers of china and glassware, with many of their items coming from high end German and Silesian porcelain factories, as well as from Lamberton Works of New Jersey. Sometime in early 20c they moved to Atlantic Ave in Boston - and apparently weren't the most scrupulous of Boston firms since there I have found records of a successful 1930's suit brought against them by Albert Pick-Broth Co. for their actions in not only hiring away employees but encourtaging them to being their customer lists and production information. This suit ultimetely made it to the Supreme Court. 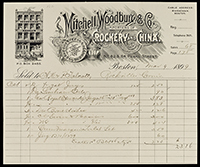 Mitchell Woodbury was apparently active until the early 1940s. 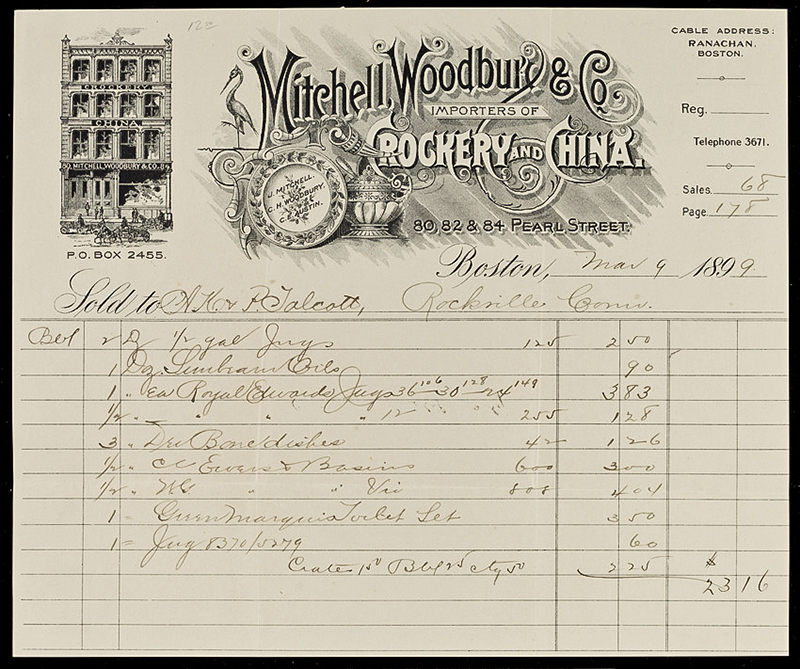 As noted above Mitchell Woodbury Co. was an impoorter and retailer - as shown here, at least some of their items were manufactured by Royal Baureuth, whose red cow head creamer is shown here next to the one marked MW Co, which was also in the section just above. 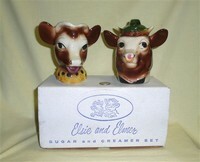 Here are two more heads that bear a resemblance to the Royal Bayreuth creamers. The “Blackpool” crested one (which is in the same series as the 3 similar to it that are shown in the Ads and Souvenirs Theme) has the “foreign” in a circle stamp, typical of imports to the UK, and seems to me very similar to those from the Royal Bayreuth molds. The gaudy one on the right is unmarked, but obviously from a different mold. 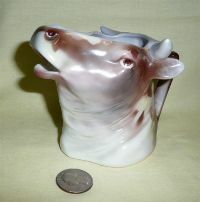 This is a second form of Royal Bayreuth cow or bull head - in this case they are actually'pitchers' since there is no hole in the mouth. Still beautifully modeled, and in a variety of colors. 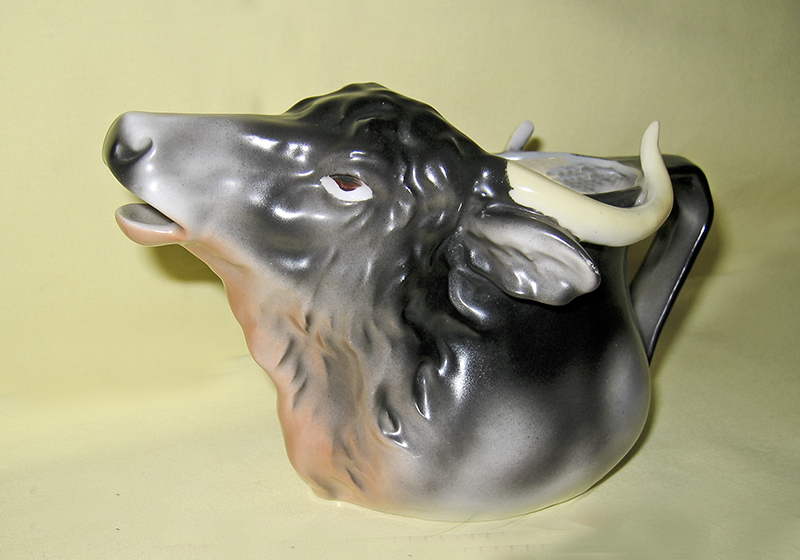 The third type looks to be more of a water buffalo, with the long curled horns. These are again 'creamers' with the hole in the mouth. 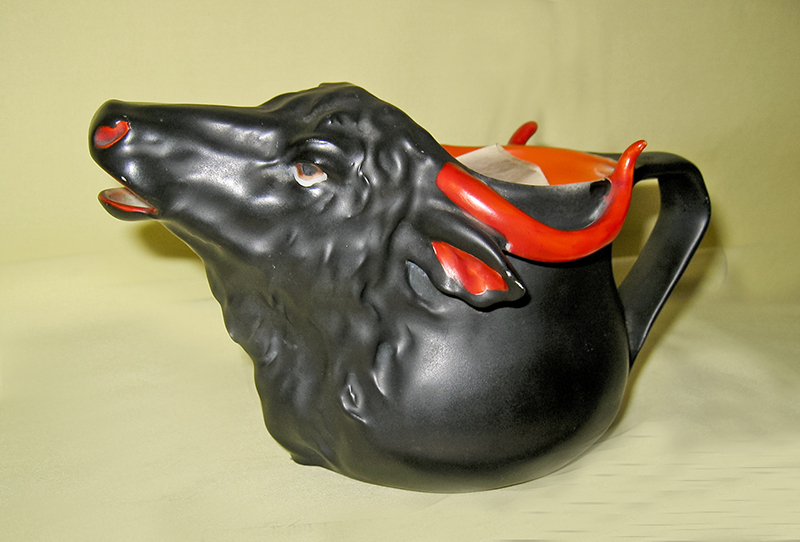 Like the other Royal Bayreuth cow or bull head creamers, their water buffalo seem to be popular for copies or at least similar versions. These two lovely examples could easily be mistaken for Royal Bayreuth, but for the 'Made in Taiwan' sticker on the base of the bisque white one. Both are really very well made, and considerably less expensive than their Bavarian cousins. This lovely realistic head is also unmarked but is known to be German porcelain, from between the World Wars. 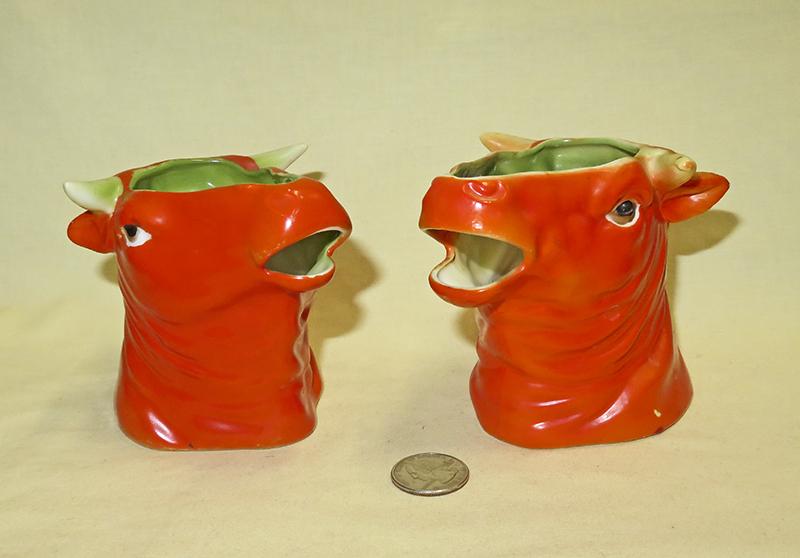 These lovely German bull heads date from the early 1900s – I know this because the largest of the three came with a note that said his mother purchased it in 1909…for fifty cents! 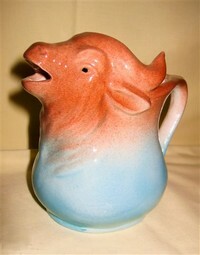 She had a large creamer collection and this was her favorite. They are no longer quite so cheap. I also believe that they were made in just these three sizes, and it has taken me many years to acquire one of each. 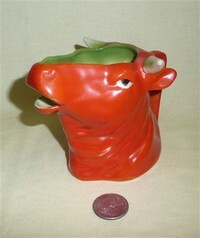 Here’s another German bull, this time with both head and tail mounted on a vase shaped container. I would guess it to be early 20c. Although it’s not marked for Germany it does have a mold number near the base, and that plus the quality and humor are a pretty good indication of its provenance. This magnificent beast is stamped for Austria under a crown. I have a very similar one marked for "Royal Floretta Ware, Austria". I have seen others for sale with yet additional marks - leading me to believe that these are all faux attributions, although for whatever reason I can't guess. Moving off the continent to the UK, this beautiful Fresian and Jersey hail from Quail Ceramics of Church Lane, Deal, Kent, whose web site notes that they have been in the giftware business for over 20 years, and have their designs made by small family businesses in Thailand. Quail is best known for their animals, birds, and especially (ugh!) cats…they have a range of named cats called “The Moggies” that apparently are quite popular, although why anyone would be the least interested in collecting ceramic cats is completely beyond me. Cow creamers of course are quite a different story. Of these two, the Fresian came first, and bears a simple “Q” as the makers mark on its base, while the Jersey’s mark reads “Quail, 2010”. Perhaps others will follow. 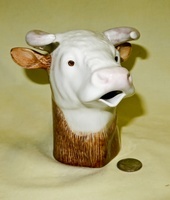 Indeed, just as postulated in the section above, another lovely Quail head did follow the Fresian and Jersey…this is a beautifully crafted and quite large Hereford Bull. 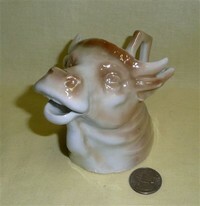 This is an interesting light brown luster-glazed head that came from the UK via eBay, but is unmarked. 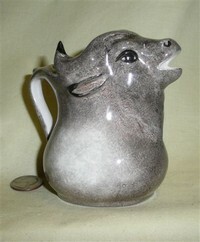 The seller termed it art deco, which doesn’t seem unreasonable to me. 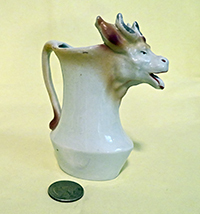 Here are two very unusual and quite large English creamers from the early to mid 19c. 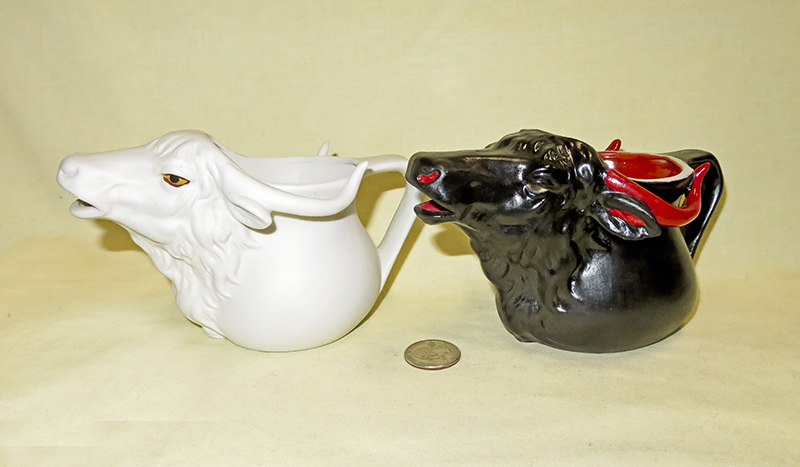 The molds are identical, albeit the white one is ceramic and the black one is made from the red clay typical of Jackfield creamers, and indeed has the Jackfield glaze with gold highlights. These were both quite expensive and the shipping prices from the UK were high, but they are sufficiently lovely as well as unusual that I couldn’t resist them. Thankfully the sellers packed well and they made it here unscathed. 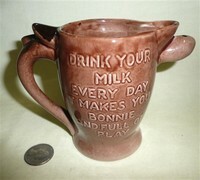 This is pretty obviously a pitcher – I probably would have passed it by but for the delightful little verse on the back: “Drink your milk every day it makes you bonnie and full of play”. English of course, albeit unmarked. 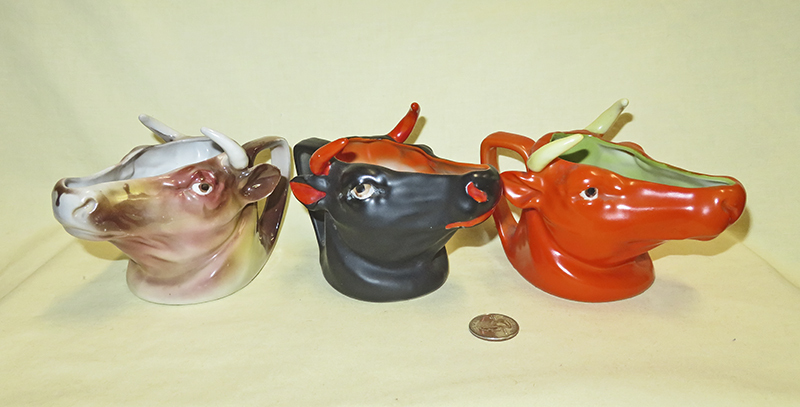 Moving over to the US, these three well made creamers are marked for Coventry, Made in the USA, mold # 5563A. I spent some time on the web looking for Coventry, only to find that it’s a quite popular name. 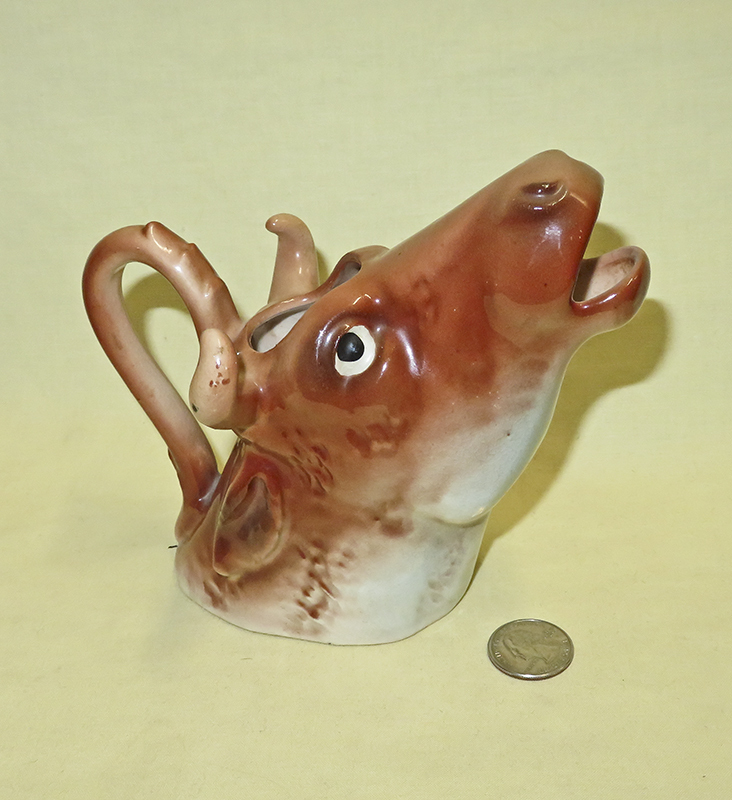 There’s a Coventry in Connecticut, and one in the UK, both with pottery makers…but my guess would be Coventry Ware of Barberton, OH, that from what I can tell operated from 1932 to about 1950. I could sure use some help on this one! This is the plastic sugar and creamer version of Borden’s Elsie and Elmer, featured in Ads and Souvenirs. 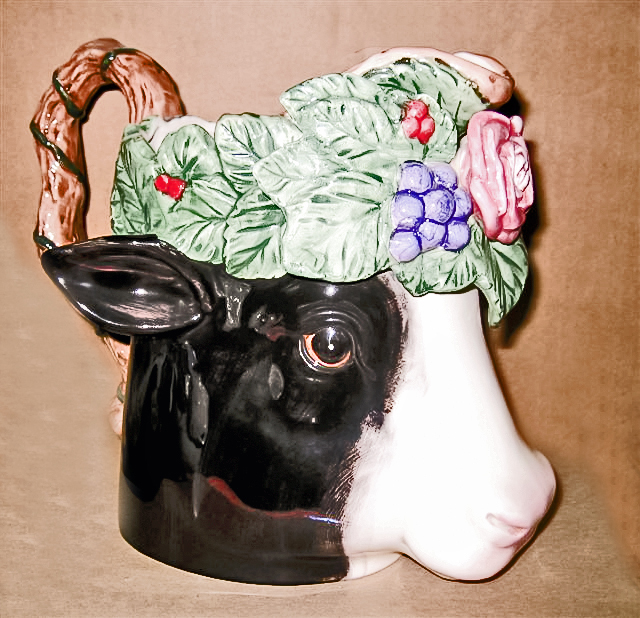 As noted there, and as with Royal Bayreuth heads, there have been a lot of copies of this favorite cow. Here are two different renditions, both from Japan. And, here are three Elsie’s that seem to be sort-of look-alikes, the one on the left even bearing her name. The two variants on the right are both impressed with the script mark “Gayet of California”. 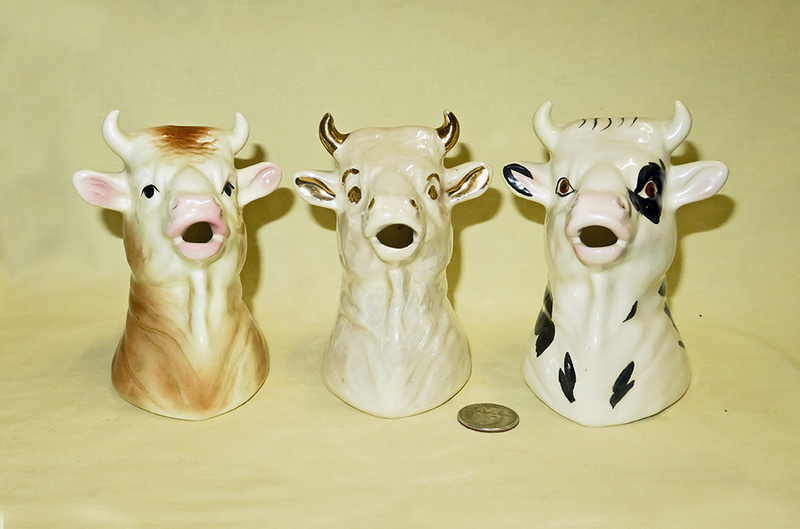 These Japanese cow creamer heads are fairly common on eBay; they come with many small variations in the bells and coloring; there is one here that probably doesn’t match…third from the left, with the crossed eyes. Here are more Japanese heads. The ones on the ends have a sticker that reads “Chase, hand painted”. 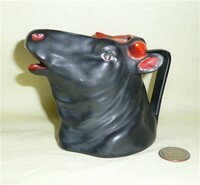 The one in the middle has “Hand Painted” over a semi-circle, and is part of a set or group that also includes a horse, a mouse, and a sheep. More Japanese versions – but pitchers rather than creamers that pour from the mouth. 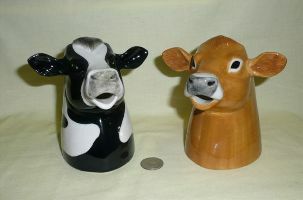 On the left are yet two more Japanese cow head creamers, and on the right a head from the same mold as the light one on the left. These two both have ‘voice boxes’ fitted into the bottom, so that they should ‘moo’ when tipped up. I say ‘should’ moo, but they seem to have a bad case of laryngitis, presumably from a combination of age and repeated use. 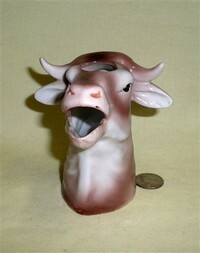 I have yet to find one where the ‘moo-er’ actually works. 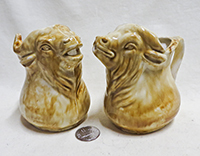 Here are two large cow head pitchers, “Cowmen Mooranda” by Vandor, 1988, and Fitz and Floyd’s lovely Heidi Holstein, of 1994, 1 ½ quart size, also featured in Favorite Brands. 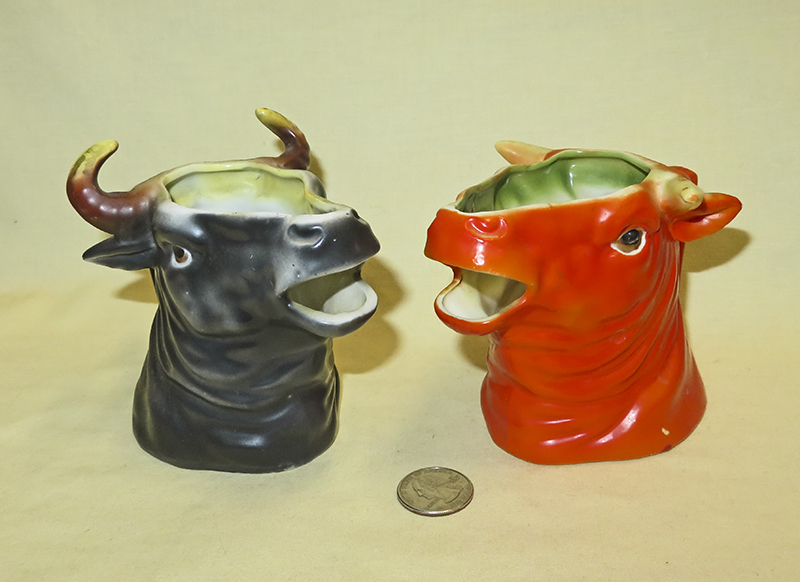 These are buffalo - bull buffalo not cow buffalo but they are attractive, come in a variety of colors, and frequently show up on ebay listed as cow creamers. At least they're inexpensive and not offensive. On the left is another version of the bull buffalo head, and on the right a somewhat different interpretation, perhaps meant to be a cow buffalo. 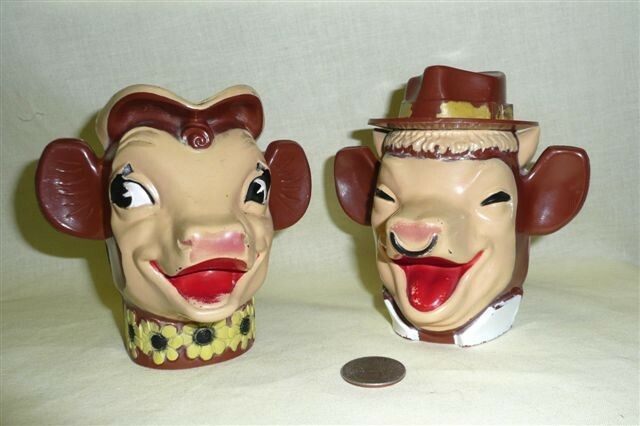 These are both marked “Made in Occupied Japan”, so the buffalo head mold has been around for quite some time. 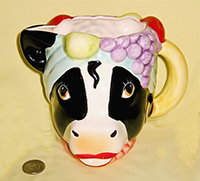 Finally for this theme, here’s a bunch of glass cow heads that come apart – these are often sold as cow creamers, but I suspect that they were originally designed to hold mustard or some other condiment.